Jazeman Jaafar, Malaysia’s leading international racing driver, returned to the track after a long off-season and wasted little time in putting in the laps with his new team. 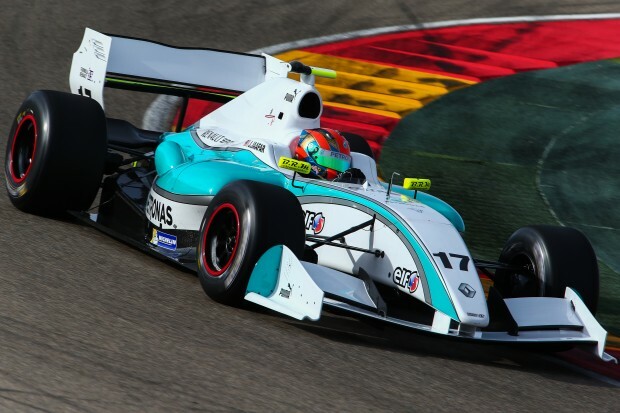 Jazeman returns to the Formula Renault 3.5 Series for 2014 and has moved team for this year’s assault on the championship, joining the successful Czech-based ISR team. The first of two official Formula Renault 3.5 Series pre-season tests took place at the Motorland track in Aragon, Spain this week. With three days of running it was Jazeman’s first opportunity to drive the ISR car this year, having tested with the team late last year. The 21-year-old driver quickly showed that he had lost none of his competitive form, putting in third fastest time on the first morning of running and ending up fifth quickest after running 45 laps on the first day. Jazeman returned to the track on the second day to continue with preparations for the season. After showing his outright pace on the first day it was time for the team to try different set up options and for Jazeman to work with his engineer and crew to develop the balance of the car and fine tune it to the new 2014 Michelin tyres. Jazeman continued to show his pace with sixth fastest time in the morning and ninth in the afternoon, with a total of 41 laps completed. On the final day of running it was mixed weather conditions. The day started dry, but rain in the late morning curtailed further serious running. With a total of 21 laps in the morning Jazeman was eleventh fastest, although his focus was on car development for the wet as it was his first time driving the ISR car in the wet. As the weather brightened after lunch, Jazeman returned to a damp but drying track. Continuing with the development, the PETRONAS supported driver continued to run comfortably in the top ten through most of the afternoon. Jazeman’s preparations for his 2014 season continue next month with the final official pre-season test taking place at the end of March in Jerez, Spain.